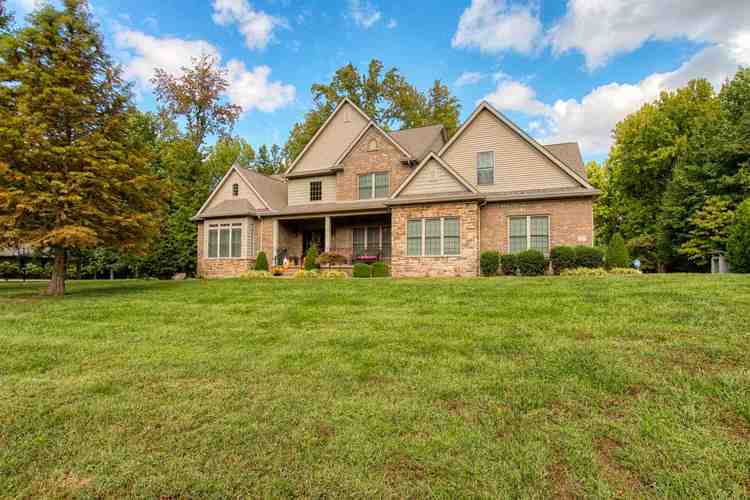 Situated on a gorgeous acre lot in a desirable subdivision just minutes from city conveniences this 4 bedroom + bonus home with 3.5 baths offers great curb appeal with covered front porch, beautiful landscaping, stone accents, and mature trees. The two-story foyer with hardwood flooring opens to the spacious great room with soaring ceiling offering a stone fireplace with built-ins, and a wall of windows providing an abundance of natural light. Family & friends will enjoy gathering for holiday meals in the large dining room with extensive woodwork. The spacious kitchen will delight any cook and is loaded with amenities including an abundance of castled cabinetry, granite counter-tops, custom backsplash, gas cook-top, stainless steel appliances including double oven, pantry, and raised serving bar with seating. The spacious dining area is perfect for casual meals and offers access to the large deck overlooking the large private lot. The spacious main level master suite offers double trey ceiling with crown molding, large walk-in closet, and access to a private screened porch with gorgeous views of the grounds. The master bath features double sink vanity, custom tiled walk-in shower, and jetted tub with tile surround. The main level also offers a guest bath and a large laundry with sink and cabinetry is conveniently located off the oversized 3 car side load garage. The staircase with wrought iron detailing leads to the second level that offers three spacious bedrooms with access to a full hall bath with double sink vanity and separate area with tub/shower combo. There is a large bonus room that is perfect for media and play with offset for games and billiards. There is an additional full bath to complete this level. Storage is not a problem with an abundance of closet space, walk-in attic access, and unfinished basement. This immaculate home is privately situated and is being offered with a one year home warranty for buyer’s peace of mind.